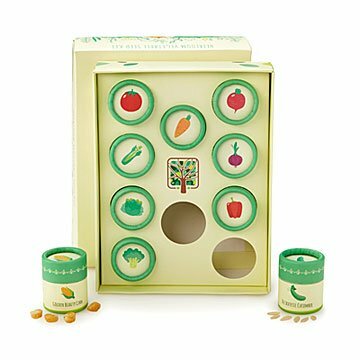 Cultivated and refined over a century, these 10 seeds sprout beautiful and delicious heirloom vegetables. Anyone who has tasted a candy-colored heirloom tomato at the peak of ripeness knows there's something special about this fruit of the vine. Heirloom veggie varieties are cultivated and nurtured over generations to yield the most crisp and delicious versions. Refined over a century, these 10 seeds sprout rows of beautiful and delicious open-pollinated vegetables. With this process, pollination occurs naturally by insects, birds, wind, or humans. As a result, plant varieties are more genetically diverse and have an easier time adapting to local conditions, no matter where your garden grows. Assembled in New York. Add some color to your garden as well with our Wildflowers Seed Kit. Full planting instructions included in each kit. My kids are devoted cooks, and loved the fact that these heirloom seeds will provide delicious and unique ingredients for their meals. Cute packaging! Enough seeds in each container to re-try a planting if needed. I loved the recommendations for plant groupings to reduce pests! Very fortunate to find a gardening gift that was more than the usual seeds. It will be perfect. So happy I found Uncommon Goods. I didn't get to open this because it's a gift, but it seems like a great pack!